Jenny Dell captured Terry Francona’s assault of Don Orsillo. I give it 8.5 Nolan Ryans. 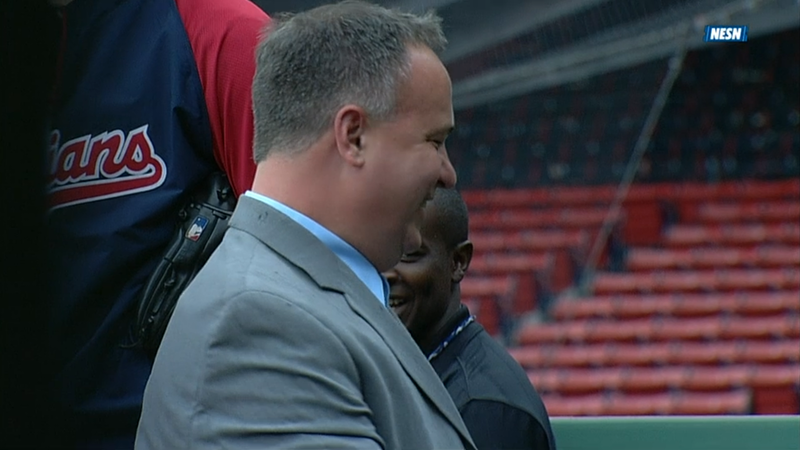 Francona got a deduction for using Orsillo’s tie; Ryan would have tackled his opponent. Orsillo’s hair suffered temporarily. Of course he carried backup hair products to restore his hairstyle to its broadcast-ready state. Fans showed their appreciation of Francona. His team had cooled off since the series opener, only mustering a single run in the third. With runners at first and second and Jason Kipnis in the box Jarrod Saltalamacchia attempted to catch Mark Reynolds stealing. The throw missed Jose Iglesias, who replaced Will Middlebrooks at third for the evening, and skipped into left field. Reynolds scored on the error. Since the run was scored on an error it was unearned, much to John Lackey’s delight. Mike Carp gave his team an early lead with a three-run homer in the second, giving Lackey the run support needed to tally his third win.